Stadium tech enhances sports fans’ experience. 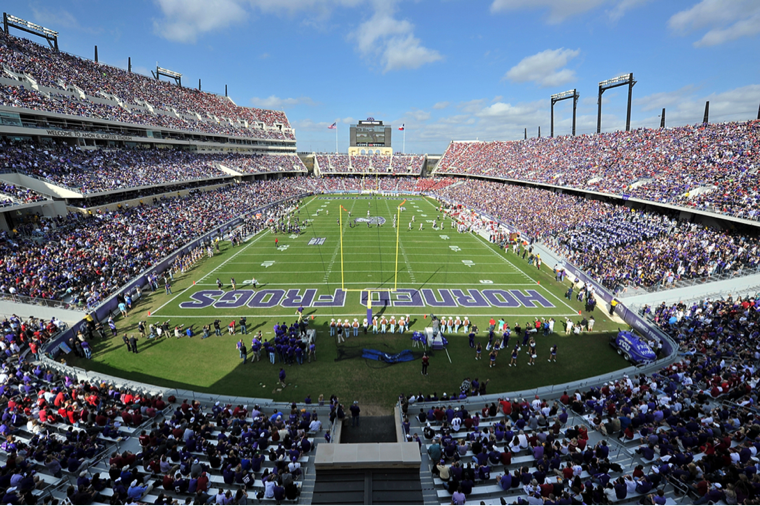 For Bryan Lucas, chief technology officer at Texas Christian University in Fort Worth, delivering Wi-Fi to more than 44,000 football fans at Amon G. Carter Stadium is just an extension of his work as a university IT administrator — one who is adjusting to an era in which college students bring multiple devices to campus. “While only about 8,000 of the fans are students, we might see a ‘take’ rate as high as perhaps 50 percent in the student sections, so we’re probably going to have to make some adjustments throughout the season,” Lucas says. The Wi-Fi rollout at the stadium follows a $164 million reconstruction project that was completed in time for the start of the 2012 football season. Lucas says the administration saw the Wi-Fi coverage as a necessity, given the high expectations of fans when it comes to technology amenities. Coverage is being added through a multiphased approach. First, Lucas and his team rolled out wireless at the ticket turnstiles, in the press area and at some of the club suites. Cellular coverage was firmed up across the stadium with the help of AT&T and American Tower, a communications infrastructure company. The second phase, which will be completed by the end of this summer, will focus on providing Wi-Fi within all of the fan areas and adding cellular coverage from T-Mobile and Verizon. Wireless antennas are being added in three ways: in 9" x 11.75" x 3.375" boxes under the stadium’s bench seating, on handrails in the middle seating sections and on poles mounted in the stadium’s upper levels. At one point, faced with an interesting technical wrinkle, engineers had to drill holes through concrete in the seating areas to run conduit back to intermediate distribution frames (IDFs) strategically placed throughout the stadium.